P = pascal(n) returns a Pascal’s Matrix of order n. P is a symmetric positive definite matrix with integer entries taken from Pascal's triangle. The inverse of P has integer entries. P = pascal(n,1) returns the lower triangular Cholesky factor (up to the signs of the columns) of the Pascal matrix. P is involutary, that is, it is its own inverse. P = pascal(n,2) returns a transposed and permuted version of pascal(n,1). In this case, P is a cube root of the identity matrix. P = pascal(___,classname) returns a matrix of class classname using any of the input argument combinations in previous syntaxes. classname can be 'single' or 'double'. Compute the fourth-order Pascal matrix. Compute the lower triangular Cholesky factor of the third-order Pascal matrix, and verify it is involutory. Matrix order, specified as a scalar, nonnegative integer. Matrix class, specified as either 'double' or 'single'. 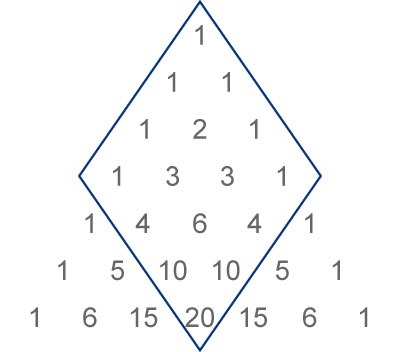 Pascal’s triangle is a triangle formed by rows of numbers. The first row has entry 1. Each succeeding row is formed by adding adjacent entries of the previous row, substituting a 0 where no adjacent entry exists. The pascal function forms Pascal’s matrix by selecting the portion of Pascal’s triangle that corresponds to the specified matrix dimensions, as outlined in the graphic. The matrix outlined corresponds to the MATLAB® command pascal(4).